Clearwater, FL., November 8, 2014 – Sometimes, even in championship games, winning and losing takes a backseat to something more important – like the memory of a departed friend. Such was the case for the Gus Strong Black Rocks. 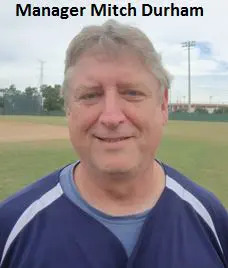 Steve Gussler, an Ohio state high school baseball coach, was a member of the team’s 2003 Fall Classic champions and the group, consisting of players from the Columbus area, vowed to return 10 years later. But when Gussler, known as”Gussie” to his friends, was diagnosed with colon cancer three years ago, playing became secondary. After finally succumbing to the disease in July, six of the original 10 team members traveled to Florida’s west coast to dedicate at least one more tournament in his honor. Atlanta, which got its only round-robin victory over Gus Strong before defeating the Triad Royals 11-4 in a playoff game, strung together five consecutive hits to score three times in the first and essentially put the game away. With Todd Hoppmyer’s pair of doubles leading an 18-hit attack, the offensive explosion was more than enough for starting pitcher Dave Smith. The lefty mixed off-speed pitches with a deceptive fastball to handcuff the Black Rocks until a three-run ninth avoided a shutout. Leading 4-0, the Astros blew the game open with a four-run sixth. Hoppmyer once again led the way, roping a double to left field and scoring on a one-out single by Mark Elliott. An infield ground out plated Elliott and Chuck Holland, before a Bryan Bart’s single capped the inning. Atlanta added single runs in the seventh and eighth, the second coming on another Hoppmyer double, helping him finish with three hits on the day.